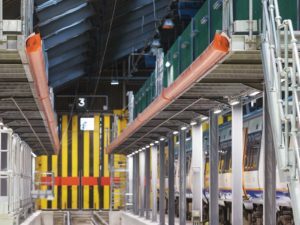 As part of a £40 million refurbishment of the Norfolk facility, the rail safety specialist is installing its flagship Depot Personnel Protection System (DPPS™) on six maintenance roads. A derailer, like those fitted by Zonegreen at Crown Point, as part of its depot protection system. Working with contractors, Taylor Woodrow and depot operator, Abellio Greater Anglia, the firm has now completed phase one of the project, fitting roads 16 and 17 with DPPS™ to prevent injuries associated with train movements. Interlocking solutions have also been installed to eliminate the risks from overhead lines. DPPS™ combines powered derailers, road end panels and visual and audible warnings to protect personnel. The system is operated via electronic datakeys, with varying authorisation levels, that allow the user to create safe zones in which staff are working. It is linked to Zonegreen’s Depot Manager software that displays key information to make operations quicker and easier to implement and offers comprehensive traceability. For more information about Zonegreen’s depot protection systems, telephone (0114) 230 0822, visit www.zonegreen.co.uk or follow the firm on Twitter, @zonegreen.